The eight Tudor & Stuart Ireland Interdisciplinary Conference was held at Queen’s University, Belfast. The conference featured over twenty-five speakers from Ireland and beyond, a special panel session, ‘Léamh: Learn Early Modern Irish – a digital guide to reading and paleography, c.1200-1650’, and plenary addresses by Dr David Edwards (University College, Cork) and Dr Deana Rankin (Royal Holloway, University of London). The conference was organised by John Cunningam, David Heffernan, Romano Mullins, Karie Schultz and Ramona Wray (all of Queen’s University, Belfast). The conference was generously supported by the School of History, Anthropology, Philosophy and Politics, QUB, the School of Arts, English and Languages, QUB, the Institute of Irish Studies, QUB, and Marsh’s Library. The full conference programme, abstracts booklet, and conference poster are available below. 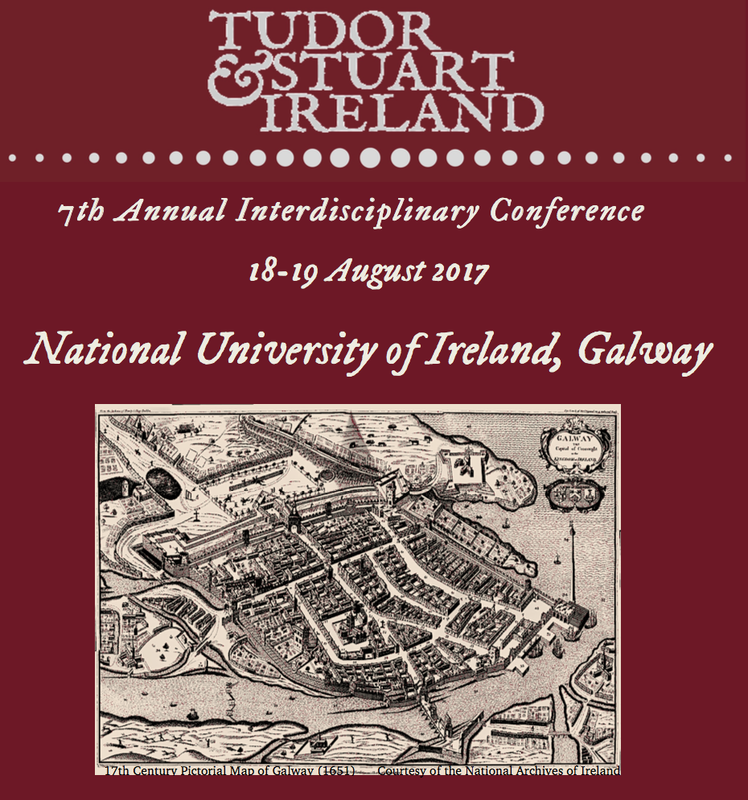 The seventh Tudor & Stuart Ireland Interdisciplinary Conference was held at the Moore Institute at the National University of Ireland, Galway. The conference featured over thirty speakers from Ireland and beyond, a special panel session on ‘Visualising Early Modern Ireland’, and plenary addresses by Professor Chris Maginn (Fordham University) and Professor Patricia Palmer (Maynooth University). The conference was organised by Evan Bourke (NUI Galway), Ioanna Kyvernitou (NUI Galway), Raina Howe (NUI Galway) and Matthew McGinty (NUI Galway). The conference was generously supported by the College of Arts, NUI Galway, the School of Humanities, NUI Galway, the Moore Institute, NUI Galway, the Discipline of English, NUI Galway, the Discipline of History, NUI Galway, Marsh’s Library and the Women’s History Association of Ireland. The sixth Tudor & Stuart Ireland Interdisciplinary Conference was held at the Moore Institute at the National University of Ireland, Galway. The conference featured thirty-five speakers from Ireland and beyond, special panel sessions in honour of Professor Steven Ellis and on Shakespeare and Ireland, and plenary addresses by Professor Mary O’Dowd (Queen’s University Belfast) and Professor Andrew Hadfield (University of Sussex). The conference was organised by Evan Bourke (NUI Galway), Jeffrey Cox (UCD), Carla Lessing (NUI Galway), and Bronagh McShane (NUI Galway). The conference was generously supported by the President’s Award for Excellence in Research (awarded to Prof. Steven Ellis), NUI Galway, the Moore Institute, NUI Galway, the Discipline of History, NUI Galway, the School of Humanities, NUI Galway. Audio recordings of forty papers from the 2016 conference are now available on SoundCloud and iTunes. The podcast series includes both plenary addresses, Age as a category of analysis: an agenda for early modern Ireland? by Professor Mary O’Dowd (Queen’s University Belfast) and Edmund Spencer the Less among the Jacobites by Professor Andrew Hadfield (University of Sussex). Among the other podcasts are papers by Professor Steven Ellis (NUI Galway), Professor Willy Maley (Glasgow), Professor Colm Lennon (Maynooth), Dr Felicity Maxwell (Galway), and Dr Brian Mac Cuarta (ARSI). The organisers wish to express their gratitude to Mike Liffey of Real Smart Media for producing another series of high quality podcasts for this year’s conference. The fifth Tudor & Stuart Ireland Interdisciplinary Conference was held at Maynooth University in partnership with University College Dublin in 2015. The conference featured over thirty speakers from Ireland and beyond, a panel session on public engagement, plenary addresses by Professor Alexandra Walsham (Cambridge) and Professor Marie-Louise Coolahan (NUI Galway), and a tour of the Russell Library. More than ninety delegates attended the event. The conference was organised by Jeffrey Cox (UCD), Eamon Darcy (MU), Damien Duffy (MU), and Bronagh McShane (MU), and was generously supported by the Irish Research Council (New Foundations), Marsh’s Library, the Department of History (MU), Graduate Studies Office (MU), and the UCD School of History and Archives. Audio recordings of twenty-seven papers from the 5th Tudor and Stuart Ireland Conference are now available on SoundCloud and iTunes. The podcast series includes both plenary addresses, The Pope’s merchandise and the Jesuits’ trumpery: Catholic relics and Protestant polemic in early modern Britain by Professor Alexandra Walsham (Cambridge) and Reportage, rhyme, and religion: How to drum up a reputation in early modern Ireland by Professor Marie-Louise Coolahan (NUI Galway). Among the other podcasts are papers by Dr Tadhg Ó hAnnracháin (UCD), Professor John McCafferty (UCD), Professor Marian Lyons (Maynooth), Professor Thomas O’Connor (Maynooth), Dr. Marc Caball (UCD), Dr Pádraig Lenihan (Galway), Dr Jason McElligott (Marsh’s Library), and Mr Paul Murray, an acclaimed biographer of Bram Stoker. There is also a podcast of the public engagement panel session with featured guest speakers Professor Brendan Kane (Connecticut), Dr Jason McElligott (Marsh’s Library), and Mike Liffey (Real Smart Media / History Hub). In addition to podcasts, both plenary addresses are available in video via YouTube using the link below. The organisers wish to express their gratitude to Mike Liffey of Real Smart Media for producing these high quality podcasts and video recordings. The fourth Tudor & Stuart Ireland Conference was held at NUI Maynooth in partnership with University College Dublin in 2014. The conference featured over thirty speakers from Ireland, the United Kingdom and beyond, as well as two plenary addresses, a tour of Maynooth Castle, and a performance by harpist Dr Sorcha McCague. More than ninety delegates attended the event. The conference was organised by Jeffrey Cox (UCD), Jessica Cunningham (NUIM), Bronagh McShane (NUIM) and Frances Nolan (UCD) and was part-funded by Marsh’s Library, the Department of History (NUIM), NUIM Graduate Studies Office, UCD Research, and the UCD School of History and Archives. Audio recordings of twenty-eight papers from the 4th Tudor and Stuart Ireland Conference are now available on SoundCloud and iTunes. The podcast series includes both plenary addresses, ‘‘Love God and hate the Pope’: (un)changing Protestant attitudes towards Catholicism 1600-2000 by Professor Alan Ford (University of Nottingham) and A single witness: Ireland and Europe through the eyes of a small man with a big nose by Professor John McCafferty (University College Dublin). Among the other podcasts are papers by Dr Tadhg Ó hAnnracháin (UCD), Professor Colm Lennon (NUIM), Professor Raymond Gillespie (NUIM), and Dr Karen Holland (Providence College). Podcasts were recorded and edited by Mike Liffey (Real Smart Media). The full conference programme and abstracts booklet are also available below. The third Tudor & Stuart Ireland Conference was organised by Suzanne Forbes, Neil Johnston, Eoin Kinsella and Frances Nolan. The event was supported by the UCD School of History and Archives and Marsh’s Library. Professor Raymond Gillespie (NUI Maynooth) delivered the conference plenary address, Doing early modern Ireland: Individuals, identities and ideas. The conference programme is available below. The second Tudor & Stuart Ireland Conference was organised by Suzanne Forbes, Neil Johnston and Eoin Kinsella. The event was part-funded by UCD Research, The Society for Renaissance Studies, Cengage Learning and the UCD School of History and Archives. Audio recordings of twenty-seven papers from the 2nd Tudor and Stuart Ireland Conference are now available on iTunes. The podcast series includes the plenary address, ‘Humiliation, destruction and death: Violence and cultural difference in Tudor and Stuart Ireland’, presented by Professor John Patrick Montaño (University of Delaware). Among the other podcasts are papers by Dr Marie Louise Coolahan, Professor Andrew Carpenter, Dr John Bergin and Dr John Cunningham. The full conference programme and abstracts booklet are also available below. The first Tudor & Stuart Ireland conference saw over fifty speakers from across Ireland and beyond come to UCD to share their ideas in an interdisciplinary forum. More than one hundred registered delegates attended the event. The event was organised by Suzanne Forbes, Neil Johnston and Eoin Kinsella and part-funded by the UCD Graduate School of Arts and Celtic Studies, UCD Humanities Institute of Ireland, UCD School of History & Archives and Proquest. Audio recordings of thirty papers, including the plenary address from Professor Marian Lyons, are available as podcasts on iTunes.